Former President Bill Clinton, speaking at a recent Denver press conference, applauded the AFL-CIO for exceeding its 2011 pledge to commit $10 billion of workers’ pension capital for job-generating investments in infrastructure and sustainable development. 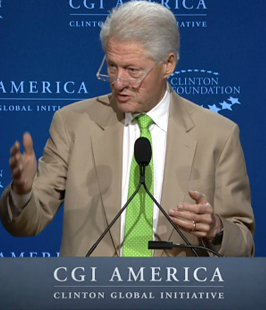 The AFL-CIO efforts along with those of the HIT and other investors of union pension capital are part of a revitalization strategy put together by Clinton Global Initiative America (CGI America), which was holding its annual conference. The AFL-CIO and its partners, Clinton said, have exceeded their original goal two years ahead of schedule by committing $10.2 billion, “by far the biggest commitment to come out of CGI America.” This represents some 33,500 good jobs to date. Accompanying Clinton at the press conference were Presidents Richard Trumka of the AFL-CIO, Randi Weingarten of the American Federation of Teachers, Sean McGarvey of North America’s Building Trades Unions, and Lee Saunders of the American Federation of State, County and Municipal Employees. Trumka, in his remarks, commended the HIT for investing over half a billion dollars since 2011 to support the AFL-CIO’s pledge to CGI America. Clinton followed this press event and the CGI America conference with an op-ed article for The Huffington Post in which he emphasized that investing in our communities is crucial “to restoring opportunity for working families and to America’s long-term prosperity.” He also highlighted the need for smart government policies, specifically when paired with businesses and community groups, and used the New Markets Tax Credit program as an example of a successful partnership. He recounted his visit to the Stout Street Health Center project, financed in part by Building America CDE, and pointed to Stout Street as an example of a successful public/private partnership.